"The presidential library will not just be a library, it will be more of a library/paintball range. We'll also have batting cages and Go Karts and that game where you drop quarters into a machine and try to knock other quarters off a ledge to win prizes." MONTEREY, CA (BRAIN)—Well known mountain biker and Wicked Racin owner Mark Reynolds died Saturday during the downhill race at the Sea Otter Classic. He was 48. MONTEREY, CA (BRAIN)—Trek launched its Women Who Ride club with a ladies-only wine and cheese party on Saturday afternoon at the Sea Otter Classic. About 30 women showed up to hear about the new club and mingle with other female riders. MONTEREY, CA (BRAIN)—The weather gods looked down more favorably on this year’s Sea Otter Classic as attendees enjoyed mostly sunny skies, with a little chilled wind—make that a lot of wind one day, with gusts on Saturday reaching 25 miles per hour. Scott USA marketing director Adrian Montgomery stopped by BRAIN world headquarters only a day after Sea Otter ended. That's dedication, baby!!! OKLAHOMA CITY, OK (BRAIN)—BikeMine has a new owner. Vittoria Industries has bought its American distributor creating a new company, Vittoria Industries North America. Fizik's marketing ringleader Suzette Ayotte is all smiles at Sea Otter. Thanks to Sea Otter and all the industry folks we talked to for making it a great experience once again. MONTEREY, CA (BRAIN)—Bicycling magazine announced on Friday at Sea Otter the winners of the 2008 Editors' Choice Awards in the bike-specific category. Bicycling's editor-in-chief Steve Madden, and product test director Matt Phillips, presented the awards to the 11 winners. WATERTOWN, MA (BRAIN)—Seven Cycles has hired Jim MacLeod to be the company's director of global sales. SINGAPORE (BRAIN)—BikeAsia, the Bicycle and Motorcycle Show of South-East Asia, held in Singapore from April 10-13, was a huge success. MONTEREY, CA (BRAIN)—Sea Otter has announced dates for next year's show. It will be from April 16-19, 2009. The first day of Sea Otter 2008 got off to a good start, with warm sun and blue skies. The forecast calls for continued blue skies and cooler temperatures over the weekend. WILMINGTON, MA (BRAIN)—Sports Adventures International S.A., a newly formed Swiss investment group, has acquired Pedro’s from its parent company, Swix Sport USA. The terms of the deal, which becomes effective May 1, were kept private. LAKE FOREST, CA—Models come. Models go. Manufacturers have always had to make some tough calls over dropping and adding models—and the last few years have been no exception. PARK CITY, UT—Sales of cycling gear online is nothing new. A quick Internet search turns up dozens of sites—including one that scours the Web for the best deals and presents results from more than 30 online sellers. 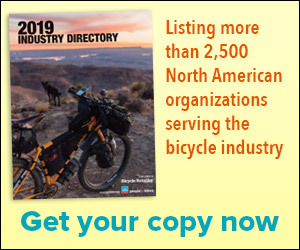 EMMAUS, PA (BRAIN)—Bicycling magazine is holding a steady pace in a negative advertising environment in which consumer magazine publishers are struggling to maintain ad revenue. Sani vs. the Web Guy was quite a titanic match up. The old man asked for a beating, and the Web Guy delivered in under 30 seconds. Sani keeps inquiring as to a rematch. Who knows, the next throwdown could be at Sea Otter, so keep your eyes peeled and greenbacks handy. CALGARY, Alberta (BRAIN)—Jennifer Collins of Guelph, Ontario is the winner of Chariot Carriers consumer survey draw. The life I love is makin' music with my friends." MONTEREY, CA (BRAIN)—Quietly over the years, the Sea Otter Classic has managed to make great strides as a "green" event by reducing its carbon footprint. MOAB, Utah (BRAIN)—Since it's IMBA’s 20th year of saving the trails, Western Spirit Cycling wanted to remind everyone in the industry why we ride.